Hotpots are very popular northern European dishes, being warming, comforting and easy to prepare. This Swiss Deli Pork Bratwurst-based example is no exception. 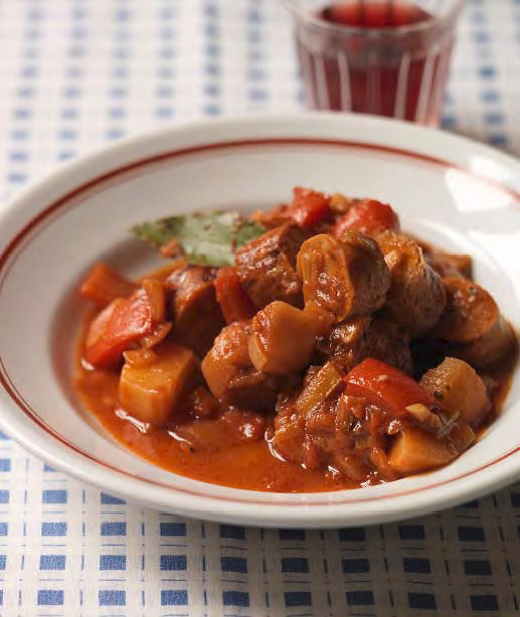 You can also use pre-cooked sausages for this recipe, such as Pork Kabbanos or Chorizo, to add a hint of smoke to the flavour. 1. Gently grill the Pork Bratwurst sausages or fry them in the olive oil for about twenty minutes until browned. Set aside to cool, then slice into discs. 2. Melt the butter in a large saucepan. Gently fry the onion, leek, garlic, paprika and red pepper for ten minutes or so. 3. Add the tomato purée, wine, thyme, bay leaves, sage, chicken stock, potatoes, tomatoes, Worcestershire sauce and sliced sausages. 4. Simmer for half an hour until the potatoes are cooked. Serve with crusty bread and butter.